Research by Kelly Hutzell, Rami el Samahy, Kristina Ricco, and Spencer Gregson. Additional production assistance provided by David Bradshaw, Paul Kim, Janice Hui, and James Garvey. Generous support provided by Carnegie Mellon University in Qatar and Qatar Foundation. 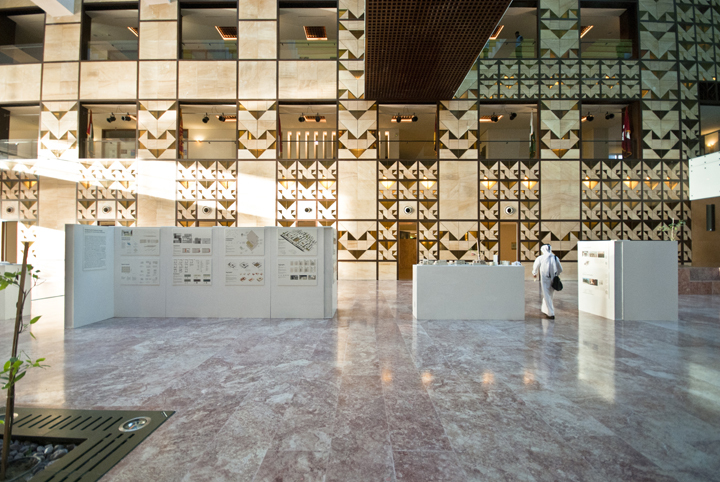 The research displayed in this exhibit represented a modest attempt to participate in Qatar's ongoing effort to move towards a more sustainable future. We posit that solutions will be found in creating a more sustainable urbanism. While green buildings are a positive step in the right direction, green neighborhoods, districts, and cities provide an economy of scale that allows for truly meaningful change. The exhibit contained a number of different threads of inquiry, and thus could be read in multiple directions. The models, presentation boards and digital displays represented five separate but related efforts. We believe that the search for solutions must define the term sustainability broadly: that which endures must not only look to sustaining the environment, but must also consider economic viability as well as social and cultural impact. New projects must be green, but must also make financial sense, and must resonate with the people who will inhabit them. Finally, as architects and urban designers, we also believe that solutions will be found through more — and better — urbanism. Cities use less resources per capita than suburbs or exurbs. Cities are also the focus of enormous creativity that arises from a density of talented people whose possible interactions are multiplied through proximity. It is our hope that this work be viewed as contributing to that creative interaction, and that it will be improved by interaction with the public. Research by Kelly Hutzell, Kristina Ricco, and Rami el Samahy. 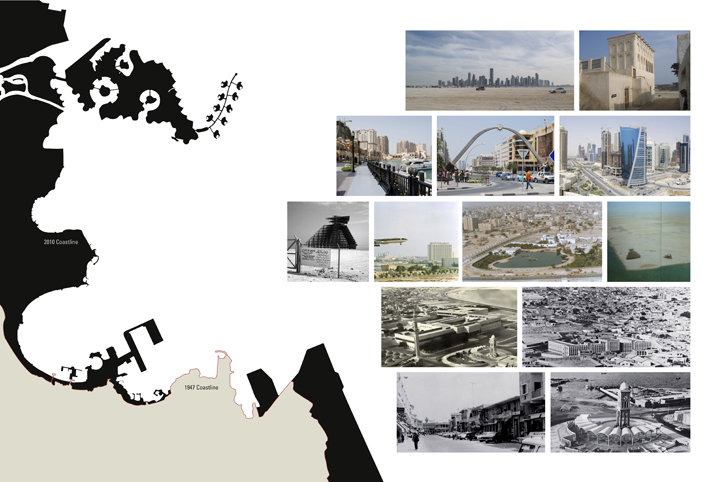 Additional student work by Rand Aga, Mohammed Al Saad, Maryam Al- Buhendi, Nayef Al-Kaabi, Amna Al-Mazroei, Issa Al-Sheeb, Ahmed Al-Thani, Maryam Alsemaitt, Khalid Alsooj, Arsalan Arif, Maria Khan, Blake Lam, Hadi Murtada, Zarmina Qazi, and Xianghua Wu. Qatar’s humble past and the dizzying pace of its current urbanization create a unique context that is continually being erased and rewritten. Seemingly overnight, the city of Doha has gone from a quiet village to a burgeoning metropolis. Over two-fifths of Qatar’s total work force is engaged in building the city, while the population continues to grow in number and diversity. Current projects promise to strengthen the connections to the region and suggest a future uninterrupted conurbation that stretches north from the town of al Khor south to al Wakra. 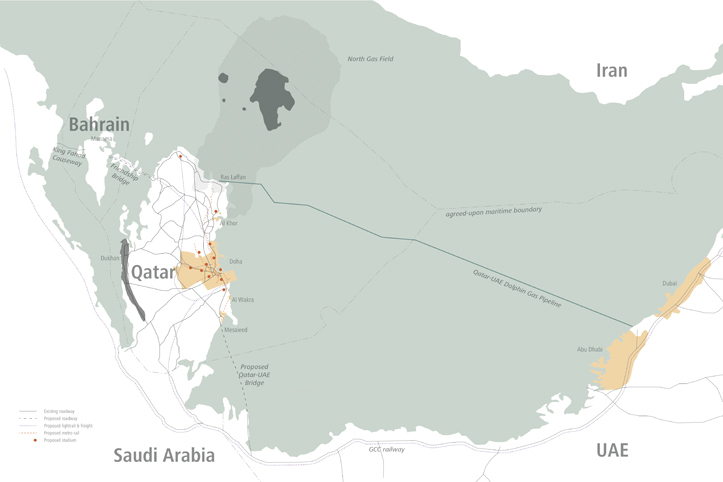 A record of research assessing the environment, population, economy, and infrastructure of Doha. Drawings examined the city's growth over time— the current megaprojects, be they industrial cities, labor camps, reviving the city center or mixed-use luxury enclaves; the evolving typologies in residential, retail, and office space; and the widely divergent kinds of public space available in the city. Having gathered and analyzed the data, a series of questions began to emerge. 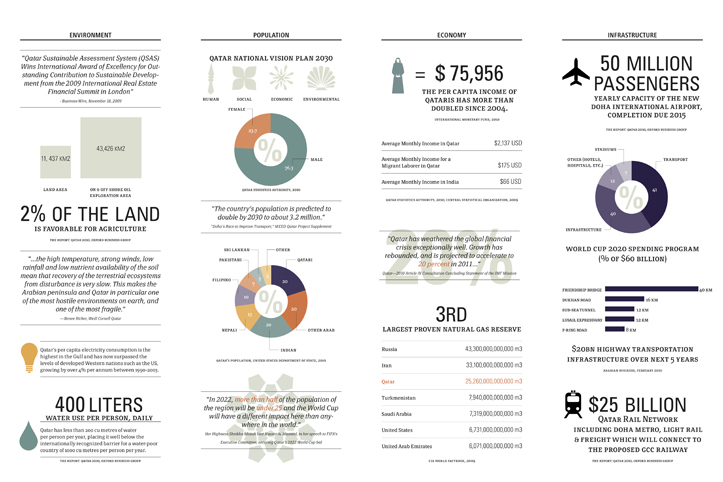 How does Qatar measure up? Who does the city serve? Will there be a demand to occupy new buildings? Will investments in public transportation change the prevailing car culture? What sorts of public spaces are needed? Is there a sustainable way forward? 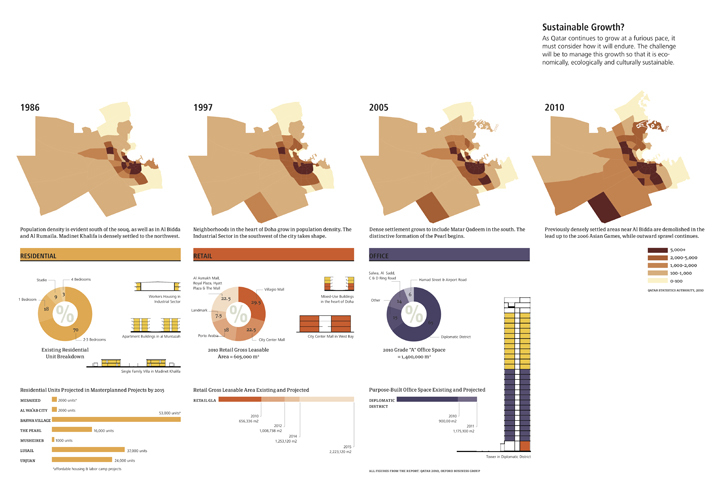 How does one design a neighborhood from scratch in a place like Doha, Qatar, where so many determinants remain undetermined? This question is pertinent to rapidly expanding cities of the developing world, currently works in progress. A modular system may hold answers, to be combined to form larger buildings, blocks, and public spaces, responding on an as-needed basis. Thus, tactics are sought to design for transition, which may or may not be as temporary as originally planned (what if the project is never completed? ), as well as for uncertainty, which is certain to remain a characteristic of the geopolitical landscape. Design for Constant Change study models. This project is further documented here. 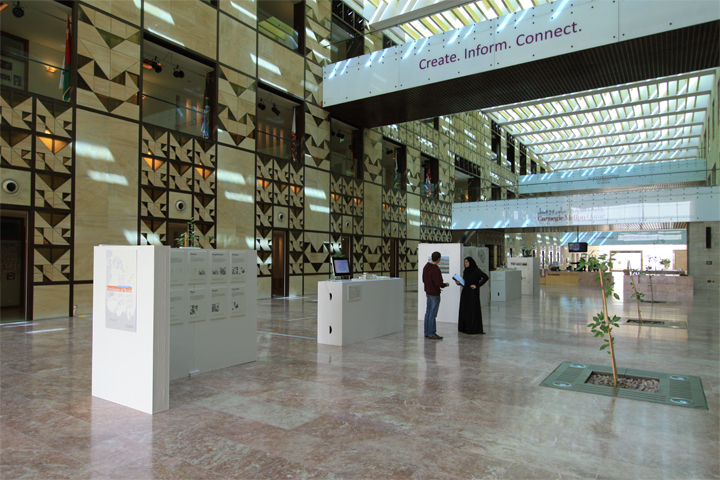 4dDoha is both an art installation and a repository of information about Doha's growth over time. It addresses the city’s astounding transformations by tracing its physical growth through an interactive display that allows users to track a variety of changes across different eras, from the pre-oil period through the current expansion facilitated by natural gas extraction. 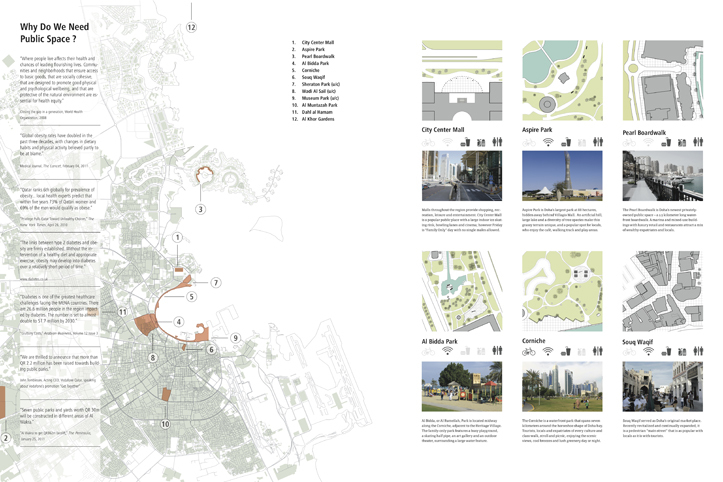 The project focuses on making spatial what was once only available as two-dimensional information, allowing one to examine the morphology of the buildings, the road network, and landfill additions creating seaports, airports and causeways. 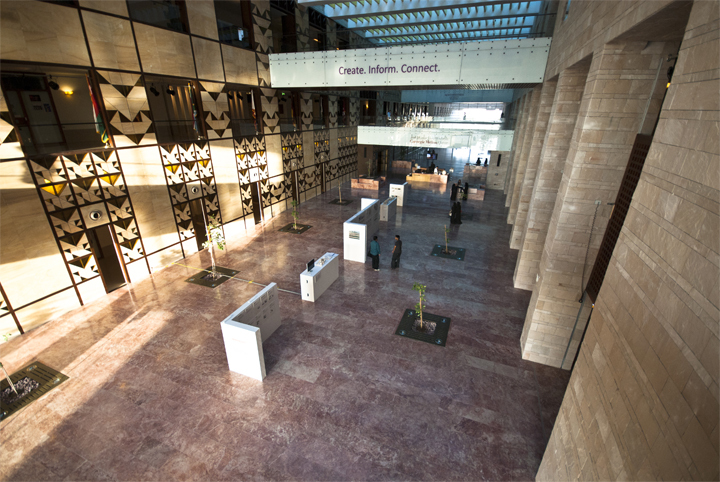 The 4dDoha interface was available as part of the exhibit which ran for four weeks, allowing time for students to interact with the research at their leisure. Data has been acquired through a critical urban reading of historical aerial imagery, as well as current Geographic Information Systems (GIS) information. The two-dimensional urban fabric was then three-dimensionally modeled using Rhinoceros and CityEngine software. Finally Processing allows one to access the interface through three distinct portals: view, time and data. These hypermedia maps integrate both narratives and historical images so that one encounters interpretative pathways while exploring the interface. 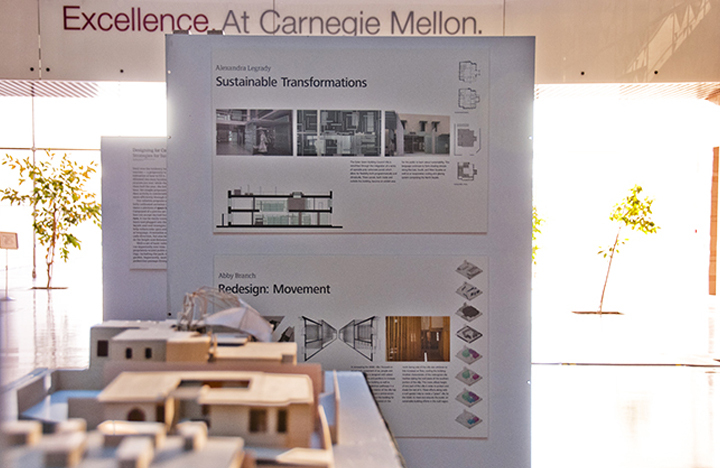 This portion of the exhibit included the work of Carnegie Mellon School of Architecture students Abby Branch, Adam Himes, Sam Kriegler and Alexandra Legrady. 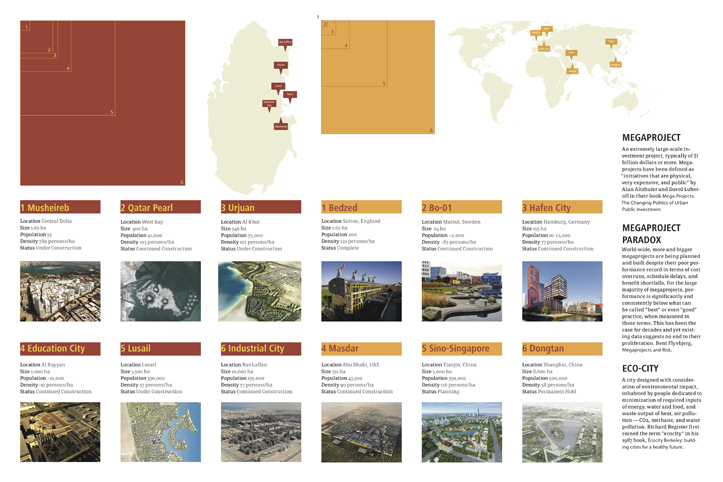 In the spring semester of 2010, fourth-year Carnegie Mellon architecture students from Pittsburgh studied abroad at the Doha campus. 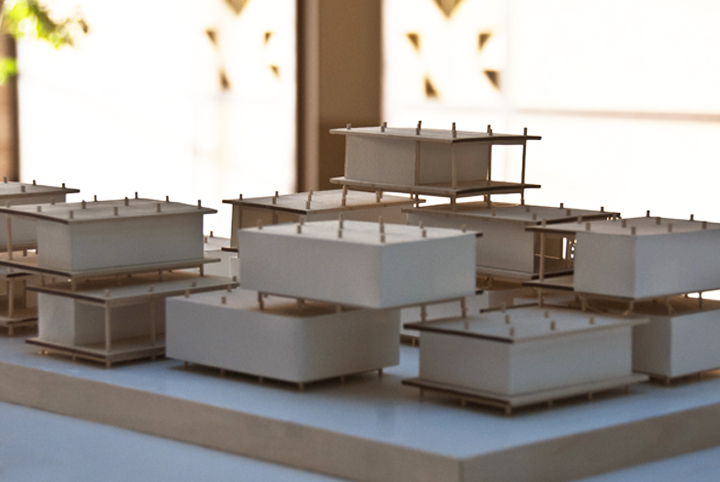 Their semester-long design project focused on a proposed retrofit of the headquarters building for the newly launched Qatar Green Building Council (QGBC). The project was intended to reflect the needs, mission, and organizational structure of the QGBC by showcasing a variety of sustainable strategies. Students were encouraged to integrate both passive and active systems. Throughout the semester, architects and engineers who serve as voluntary members of the QGBC provided comments and feedback. Student work in the Ecologies of Scale exhibit. Special thanks to the following members of the QGBC: Issa Al Mohannadi, Hussein Moussa, Gordon Jack, Alex Amato, Sandra Dold, and Hani Awni Hawamdeh. This course was as an architectural appreciation course for students from other disciplines in which they were introduced to basic concepts of architecture and the nature of a studio. Form-making, problem solving, and visual literacy were explored through a variety of drawing and three dimensional exercises. For this exercise, students were asked to design an outdoor learning pavilion to be housed on the grounds of the Qatar Green Building Council headquarters. 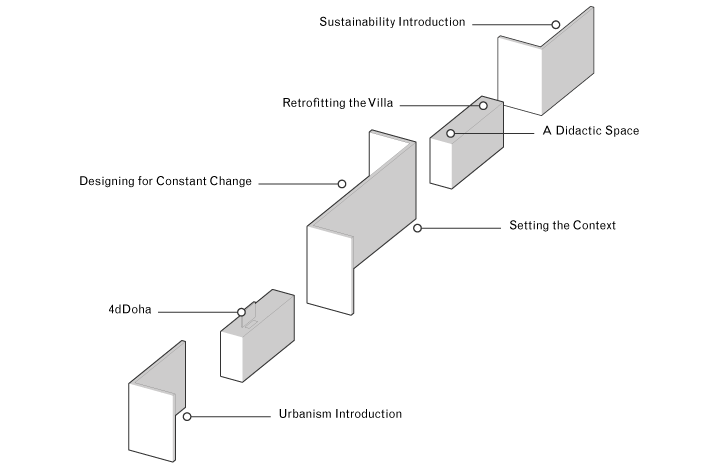 The space had to reflect an understanding of passive techniques for designing sustainable spaces, including effective shading and ventilation strategies. Students were also asked to consider human scale, degree of enclosure, light, color, texture, and pattern.